Did you know there’s a magic best height to hang art? 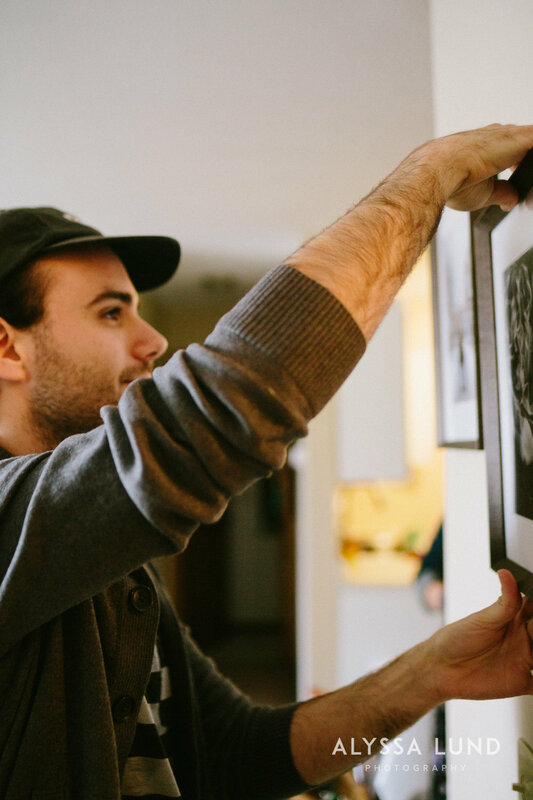 While there isn’t one rule for hanging art that applies to every situation, there are some best practices to use when choosing where and to place art on your wall. 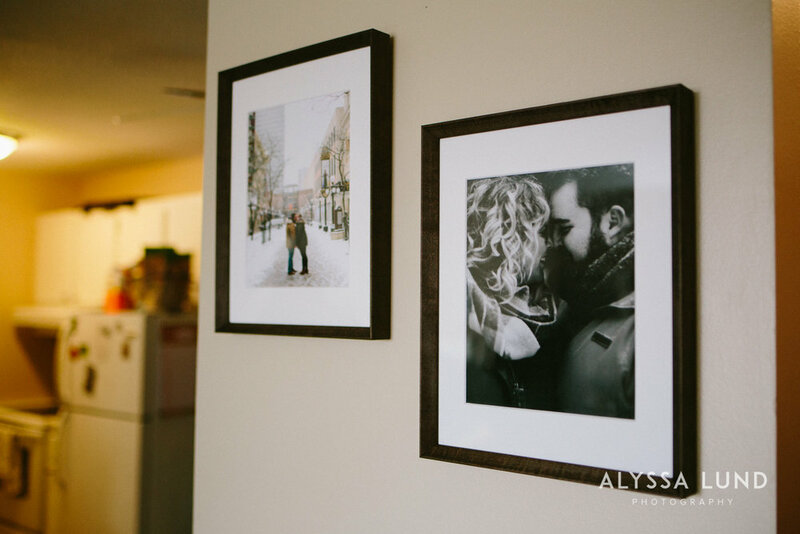 Read on to learn some tips and see what we considered when we hung Emily and Tommy’s engagement art. First, credit where credit is due, I’m not a gallery expert. But my partner, Tyler, worked in a museum gallery hanging art for years and brings his expertise to every piece of art we develop for our couples. Before we designed their art, Tyler and I visited Emily and Tommy’s home to see how they live and decorate. I do these artwork consultations for each of my couples (honestly one of the most fun parts of my job!) I want to see how my couples interact with their space so we can choose pieces that match and compliment their lives and even help to style the session itself to compliment the colors and vibe in their home. Emily and Tommy’s home is the warmest, happiest, coziest place. Full of meaningful knick-knacks from their lives and travels together and posters form their favorite concerts. The house was full of warm wood tones and, bright pops of red and orange and turquoise. We designed a gallery with two images from their engagement session. A black and white photo of them cozy and romantic, and a color photo of the two of them in front of the Palace Theatre. Because the photos had different color palettes, we unified the gallery with matching frames in a dark, espresso-colored wood. Choose the right location in your home. The right location is different for everyone but generally I encourage couples to choose a spot where they’ll get to appreciate their art every day. Some popular choices are: your entryway, where your art becomes the first thing you see when you walk in the door and you get to experience that beautiful memory each time you enter your home; your living room, so that the art sets the tone for all the interactions you have in your space and becomes a focal point for guests experiencing your home; your bedroom, so that your art becomes the first thing you’ll see in the morning, and the last thing you see at night (your bedroom is a lovely space for a more personal or intimate portrait for just the two of you); your hallway or stair space, can be a great opportunity for gallery wall so that every time you walk through your house you can re-experience the journey of this season of your life. For Emily and Tommy, we chose a spot in the center of their house. When choosing a frame, think about both the photo and your decor. A frame can enhance or compliment the colors or vibe in the photo. For example a photo taken outdoors with lots of warm light and greenery might be complemented by an organic, walnut wood frame, whereas a photo taken downtown or indoors might be better set in a slim metal frame to compliment the architectural details. You can also consider your decor: what colors and styles are present in your space and what kind of frame or gallery feels most natural in your home. Emily and Tommy chose these espresso-colored wood frames, their sleek, clean lines draw attention the the photos and the warm wood blends beautifully with Emily and Tommy’s style. Start with the best height. Museums usually hang photos so that it’s easy to rest your eyes on the art. It’s not too high or low. When hanging your art, think about where you’ll be viewing it and make sure you can look at the picture with your head in a neutral position. When you don’t have to look up or down to view the art, it’s easiest for the human eye to enjoy the image and take in the content. With Emily and Tommy’s art we measured out this height to have a starting place and then adjusted from there. We don’t all live in museums; in our homes we have things like furniture, different ceiling heights and historic, crooked walls that affect the placement of art. Don’t be afraid to adjust the height to account for your ceiling or furniture, or hang your photo in line with your slightly crooked historic walls so that it looks level, even if it isn’t. When we were hanging Emily and Tommy’s art, we were placing the portraits over a console table, and Tyler decided to hang the art a bit higher than he might otherwise so that the photos didn’t look crowded against the table. Take into account things like light switches, doors and windows and corners. Your art shouldn’t impede movement or daily tasks in your home. For Emily and Tommy, there’s a light switch on this wall, so Tyler placed the photos a bit closer together so that Emily and Tommy didn’t thwack their art every time they turned on the light and so that there was a bit more whitespace between the switch and the frames. Step back, see how it feels. When art isn’t hung correctly generally the feeling it creates is that something is “off” but you can’t put your finger on exactly what. If the room feels “off” or unbalanced after you hang your artwork, you may need to step back, consider all the room elements and adjust a bit. When we hang art together, Tyler uses all the fancy levels and rulers to get the placement right, but I’m always stepping back, checking in with the couple and making sure the art just feels right in the space. Those are six tips for hanging framed art and photos in your home. I’m super passionate about my couples having beautiful, tangible pieces of art in their home to remember all the moments and emotions in this special season of their lives. To learn a bit more about how I design artwork, visit my artwork page. Or see more real couple artwork examples: Paul & Tracy’s Engagement Gallery Wall, Jen & Eric’s Leather Wedding Album, Matt & Aybike’s Foil-Embossed Wedding Album, Emily and Ian’s Modern Wraps, Alli & Tavish’s Large-Format Wedding Art.